Residential rates always seem to be in the news for one reason or another. These days, residential rates are the subject of pending legislation (AB 327) and an ongoing rulemaking at the California Public Utilities Commission (CPUC) (R.12-06-013). To help add some context to the discussion, we will be writing a series of blog posts to address the history of how we got the current residential rate structure, a bit about the inclining block structure (tiered rates) that we have today, and some of the outcomes of the current residential rate structure and legislative action to address residential rates. To understand the current discussion about residential rates in California, we have to go back…way back… to 2001. It seems like ancient history, but the current discussion of residential rates in California involves decisions and actions as a result of the 2000-2001 California Energy Crisis. You remember: Enron, rate spikes, blackouts, capped residential retail rates, utility bankruptcy, and the California Department of Water and Power stepped in to purchase electricity on behalf of the beleaguered utilities in the state. Dissertations have been written on the California Energy Crisis, but for our purposes here, let’s focus on the “capped rates” part. Prior to the Energy Crisis, California’s investor-owned utilities had a two-tier rate structure in which the marginal price for electricity in the second tier was 15-20% higher than the first tier (Borenstein 2008). We discuss the origins of those rates below. In the midst of the crisis, when residential rates were rising, the legislature adopted Assembly Bill (AB) 1x, an omnibus bill that, among many things, capped rates for residential electricity at 130% of baseline. The bill stated that “[i]n no case shall the [Public Utilities Commission] increase the electricity charges in effect on the date that the act that adds this section becomes effective for residential customers for existing baseline quantities or usage by those customers of up to 130 percent of existing baseline quantities, until such time as the department [of Water Resources] has recovered the costs of power it has procured for the electrical corporation’s retail end use customers as provided in this division” (Water Code 80110). So, rates for electricity in place at the time AB 1x passed (February 2001) for residential electricity consumption up to 130% of baseline were to be capped until the Department of Water Resources Bonds were recovered. To understand the effect of this cap on 130% of baseline, we also need to understand what a “baseline quantity” is. The Warren-Miller Energy Lifeline Act of 1976 required the California Public Utilities Commission to “designate a baseline quantity of gas and electricity necessary to supply a significant portion of the reasonable energy needs of the average residential customer at rates below average cost.” (Order Instituting Rulemaking R.12-06-013). The Warren-Miller Energy Lifeline Act of 1976, codified in California law, defines “baseline quantities” as “a quantity of electricity or gas allocated by the [Public Utilities] commission for residential customers based on from 50 to 60 percent of average residential consumption of these commodities, except that, for residential gas customers and for all-electric residential customers, the baseline quantity shall be established at from 60 to 70 percent of average residential consumption during the winter heating season. In establishing the baseline quantities, the commission shall take into account climatic and seasonal variations in consumption and the availability of gas service…”(Public Utilities Code Section 739 (a)(1). The policy goals of the Warren-Miller Act were to ensure equitable rates and to encourage conservation. As a result of this legislation, residential rates were broken into two tiers until 2001 (Order Instituting Rulemaking R.12-06-013). Baseline allowances vary by season and by climate zone. 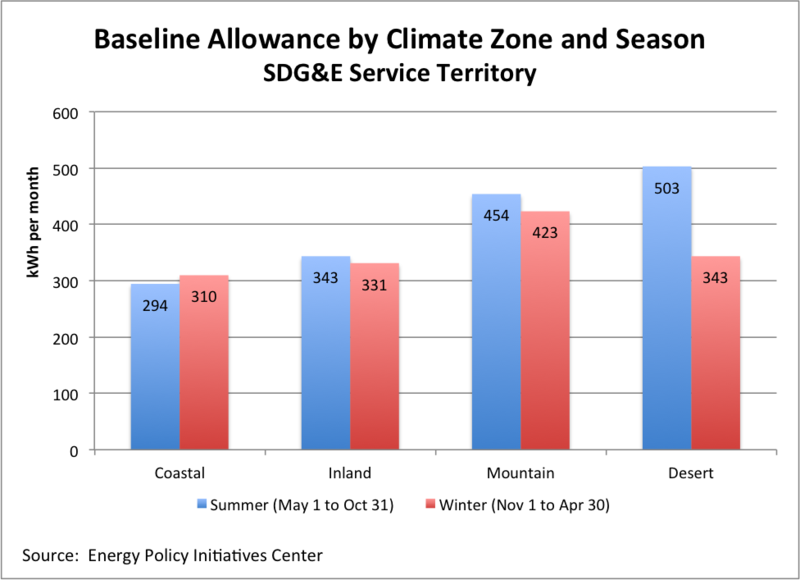 As an illustrative example, the figure below shows monthly baseline quantities for the San Diego Gas and Electric service territory for each climate zone and for the summer and winter seasons. Determining baseline quantities for the other two investor-owned utilities is more complicated due to larger service territories and numerous climate zones. 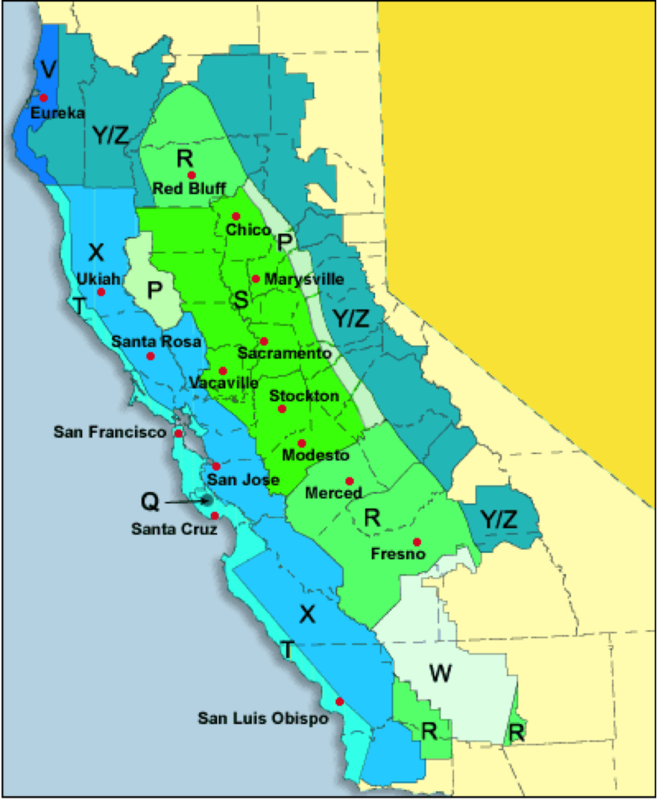 For example, Southern California Edison has 9 baseline regions based on climate and Pacific Gas and Electric (PG&E) has 10. The figure below shows PG&E’s baseline map. In the San Diego Gas & Electric territory, about 70% of all consumption falls within the 130% of baseline cap. Similar percentages hold true for California’s other large investor-owned electric utilities: Pacific Gas & Electric, and Southern California Edison (Assembly and Commerce Committee Bill Analysis for AB 327). After AB1x became law, the “CPUC adopted a five-tier increasing block rate structure for residential customers [D.01-09-059, D.01-05-064], with rates for tiers 1 and 2 capped at 2001 levels and three tiers for usage above 130% of baseline that were uncapped.” (Order Instituting Rulemaking R.12-06-013) In our next blog post, we will discuss inclining block rates, the policy rationale behind them, and how residential electricity rates look today in California. This entry was posted in Energy and tagged California, Electricity, Energy Efficiency, rates, Residential. Bookmark the permalink. Scott: Good summary. It is also important to note that the IOUs have had optional residential time-of-use rates for many years, too. According to PG&E, they established voluntary residential TOU rates in 1982. For a number of reasons, customers have not been generally interested in moving from Inverted Block rates to TOU rates. One major hurdle was that the customer would have to pay for a new meter. With the advent of Smart Meters, customers no longer have to directly pay for a new meter to move to a TOU tariff.